Is there anyone who plays Mass Effect and doesn't immediately or soon thereafter replay it? I have ME3 loaded and patiently waiting, but I decided that I wasn't happy with certain decisions made and opportunities missed in ME2. I also opted to get the DLC this time around. Unfortunately, as soon as I started up Lair of the Shadow Broker, I felt a rant coming on. The added content was fantastic and I recommend it for anyone who loves this game - nay, this story. 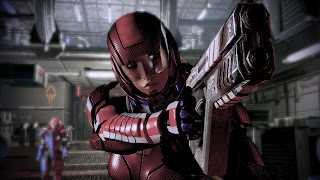 But therein lies the problem: this DLC and Arrival contain fairly significant story elements that don't merely enhance the overall story, but fill in some rather glaring blanks between the death of Shepard in the prologue of ME2 and her resurrection, and Shepard's employment status at the beginning of ME3. Making customers pay extra for additional costumes, characters and quirky side quests is one thing, but unless this is an MMO that is expected to last for years and therefore requires freshening up every now and then, full on story-enhancing content should be part and parcel. Buuuuut the powers that be who can only see dollar signs while claiming this process is to help stop piracy know that the players that be who truly love the product are still going to pay because they want to play - angry ragequite death threat blogs rants and forum posts be damned. We're suckers like that. And it looks like ME3 is going to take full advantage of that. Moving on, Lair of the Shadow Broker was more than just story enhancing. It was also a precious moment where Shepard got to express herself. When you're busy saving the galaxy multiple times for people who hate, ignore or don't believe you, you get frustrated and sometimes; you really just need a comforting shoulder. Liara was Molly's love interest in ME1 so I took the opportunity to get some proper closure. I note that the game didn't seem to want Shepard to pursue this relationship here. The mouse click paragon options barely lasted a second, unlike the other such moments. It was also somewhat comforting to learn that Molly's resurrection by Cerberus had some emotion and connection behind it, rather than just being another questionable Cerberus endeavour. Now the real reason for my replay was because I was disappointed in two things. The first being that Zaeed Massani did not die despite losing his loyalty on his mission. Granted, I didn't put him in a position to die the first time through. This time, I had him hold the line and so I got my wish. Unfortunately, it was at the cost of Tali. I don't know what I did wrong, having not only saved her from exile, but saved her father's legacy, too. Perhaps it had something to do with me trolling her with Legion. I made a point of getting him much earlier this time so I could use him more, which then inspired me to take him along on all Quarian related adventures (save for Tali's actual loyalty mission... that would just be mean!). Cruel, cruel karma! I had, ironically, considered sending Legion in Tali's place as the tech specialist, but because I'd lost his loyalty in the confrontation between him and Tali, I didn't want to risk his death. The second reason for my play through was the same reason as my ME1 second play through: Paramour not achieved! 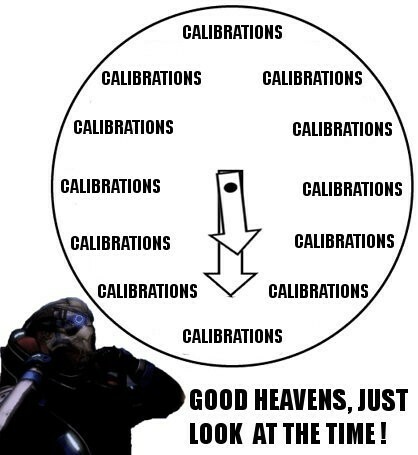 Turns out, you just can't be coy with Garrus or else he spends the rest of his time calibrating. So this time I jumped on the opportunity and witnessed all the awkward glory! I didn't care much for Garrus originally, but now I am madly in love and promise to stay true (Liara is okay with this). Yeah - as someone who isn't a big gamer, it's easy for me to be more forgiving of things like the DLC issue; I got Dragon Age 1 when all the DLC had been bundled onto the special platinum version of the game that came out two years later because it was so popular. With Mass Effect 2 I was lucky enough to get a second hand copy at like, half price, and also buy it during a month when XBox Live had ME stuff at half price as their monthly offer. But...if I were more of a gamer - if this weren't a rare thing I do, it would piss me off something chronic. ME3 has day one DLC too. I shelled out for it. It was okay, an extra mission and an extra companion, but so far seems more in line with Kasumi and Zaeed rather than The Arrival or Lair of the Shadow Broker. Apparently if you don't have them, the dialogue in ME3 fills you in, but I agree - much more satisfying to play through them. 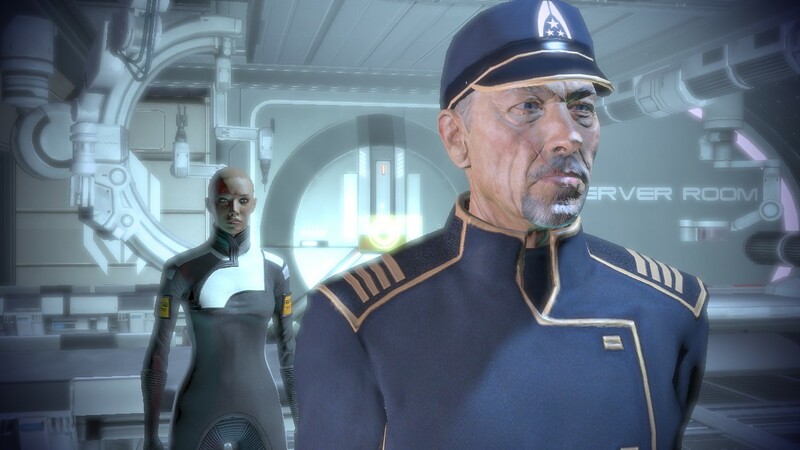 I LOVE the idea that Admiral Hackett is Shepard's dad! They're a super military family, that's why she calls him Sir all the time! Also yeah, I think that if you side with either Legion or Tali (similar to siding with either Miranda or Jack), rather than yelling at them or appealing to them to compromise, it adds to the chance that the one you sided against will die. :( But I tried to look up all the variables that made people die on that mission and frankly I was totally lost so I probably shouldn't speculate. I'm about 20 hours into ME3, and no spoilers, but so far I'm having a great time. If I still feel this way by the end, I might have to go back to the start and play the whole thing through to do some stuff I missed out on doing at the time/try other romance options, etc. Although all three games would be a huge commitment of time, so we'll see. Sentinel is my favourite class though! Apparently it's the hardest to play well, but since I play everything on casual that's never been a problem. CHALLENGES? I WANT NO CHALLENGES! Ahaha I'm playing my Sentinal on Casual too. I usually go for normal, but I want story more than action and will likely play ME3 on story mode for at least one character. I love that they offer that option! I really didn't care for Garrus in the first. I mean, I liked him, but he was just there. Something clicked in ME2 though and now I take him with me everywhere. Kaidan bugged me in the first play through so I was quick to kill him off lol. But now I suddenly have feelings for him! So Tarisa is going to be truuuuue!